20 Years of Performance Measurement System (PMS) Implementation in Indonesian Local Governments: Why is Their Performance Still Poor? 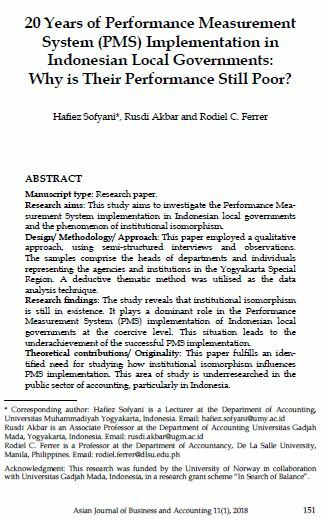 Research aims: This study aims to investigate the Performance Mea- surement System implementation in Indonesian local governments and the phenomenon of institutional isomorphism. Design/ Methodology/ Approach: This paper employed a qualitative approach, using semi-structured interviews and observations. The samples comprise the heads of departments and individuals representing the agencies and institutions in the Yogyakarta Special Region. A deductive thematic method was utilised as the data analysis technique. Research findings: The study reveals that institutional isomorphism is still in existence. It plays a dominant role in the Performance Measurement System (PMS) implementation of Indonesian local governments at the coercive level. This situation leads to the underachievement of the successful PMS implementation. Theoretical contributions/ Originality: This paper fulfills an iden- tified need for studying how institutional isomorphism influences PMS implementation. This area of study is underresearched in the public sector of accounting, particularly in Indonesia. Practitioner/ Policy implications: The results of this study show that there is a need for the government or authorities to focus more on understanding how institutional isomorphism at the coercive level may lead to poor PMS implementation. The authorities also need to improve the condition by emphasising on normative isomorphism which can address the problems caused by limited information system, budgetary, human resources and difficulties in determining performance measures. Research limitation: This study is limited to the Yogyakarta Special Region province thus findings cannot be generalised while the approach used is confined to the qualitative method only. This may also affect the outcome of the findings to some extent. Keywords: Local Government, Institutional Isomorphism, Perfor- mance Measurement System, Public Sector Accounting. SOFYANI, Hafiez; AKBAR, Rusdi; FERRER, Rodiel C.. 20 Years of Performance Measurement System (PMS) Implementation in Indonesian Local Governments: Why is Their Performance Still Poor?. AJBA, [S.l. ], v. 11, n. 1, p. 151- 184, june 2018. ISSN 2180-3137. Available at: <https://ajba.um.edu.my/article/view/12152>. Date accessed: 25 apr. 2019. doi: https://doi.org/10.22452/ajba.vol11no1.6.